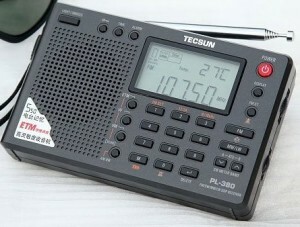 The Tecsun PL-380 is a DSP FM/MW/SW/LW ultra-light portable radio. It is well known to deliver good performance for its price class. As with all Tecsun products, they are available through reputable eBay sellers based in Hong Kong. Please scroll down the page for a link that will search eBay automatically for the PL-380. The PL-380 uses the Silicon Graphics si4734 micro-chip. Noise Limit sensitivity: FM band < 3uV @30dB, MW band <1mV/m @26dB, LW band <10mV/m @26dB, SW band < 20uV @ 26dB. Search Amazon.com for the TECSUN PL-380. This entry was posted in Portables, Tecsun, Ultralight and tagged PL-380, Si4734, SiLabs Si4734, Silicon Labs, Tecsun, Tecsun PL-380, Tecsun PL-380 Modifications, Tecsun PL-380 Reviews, Ultralight. Bookmark the permalink.